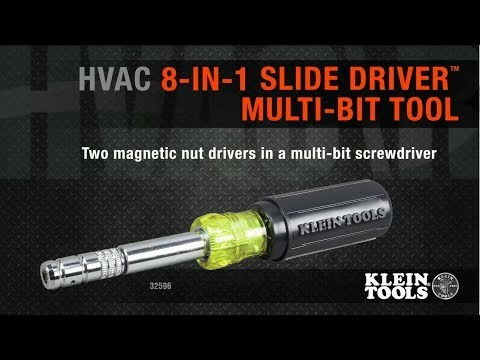 Unique, patented head slides back and forth to switch from 1/4-Inch to 5/16-Inch magnetic hex-head screwdriver. Convenient thumb nut locks tip setting. This HVAC multi-bit driver includes a specialty bit for the installation/removal of common TR-4 Schrader® valves as well as regular 1/4-Inch and 3/8-Inch nut drivers plus Phillips/slotted double-ended bits. Offers the HVAC tech the convenience of having magnetic nut drivers on a multi-bit screwdriver.